At the heart of the Midas Fleet Services program is an advanced web–based fleet management system that provides you with controls that can translate into real savings for your company, both in time and money. Midas uses this program to offer you controls on purchases and to provide you visibility of the repairs and maintenance performed on your vehicles. Line item detail for all maintenance and service work performed at Midas. 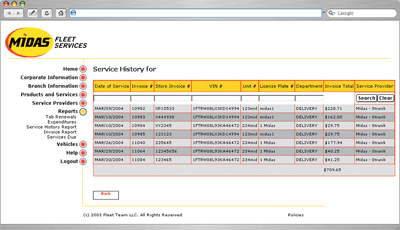 Complete snap shot of all vehicles in your fleet, separated by your business structure. Comprehensive driver and location information. Expenditures for maintenance, repairs and fuel purchases* at any level you desire – corporate, department, vehicle, etc. Our fleet application provides you with similar benefits to that of a national maintenance management company without the cost! Enjoy full access to vehicle history for all the vehicles in your fleet. Our system is designed to give you full visibility into the cost associated with your vehicles. The application even allows you to record non–Midas transactions such as body work, glass repair, etc. When you sign on with Midas, we’ll provide you with full access and hands–on training for use of the system. Nobody understands your need to keep your vehicles on the road better than Midas. That’s why we offer an array of preventive maintenance services designed to keep your vehicles on the road – making money for you. Because many of our shops are open six days and five nights a week, your vehicles can be kept in service when you need them the most – at peak business hours. Many Midas shops have the latest state–of–the–art computerized diagnostic and maintenance equipment that is capable of performing advanced services required by your vehicles. We perform repairs, maintenance and services with some of the best, most highly trained technicians in the industry. 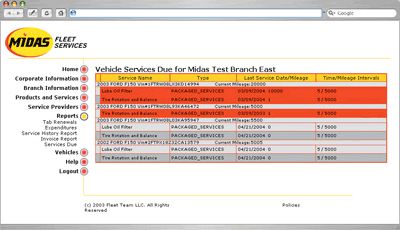 The Midas Fleet Services program includes service notifications and reporting to let you know when services are due and on which vehicles. We even flag services that are severely past due. Lube, oil and filter changes. Service intervals can be set to follow OEM recommendations or can be customized by the fleet manager based on their own preferences. Our report driver provides you the option of looking at your fleet at the aggregate level or drilling down to a single transaction. Our reporting even allows you to run reports on non–Midas transactions that you entered into the system. Now that’s functionality!